This style runs a bit smaller than our other rash guards. We recommend for you to take a size up. 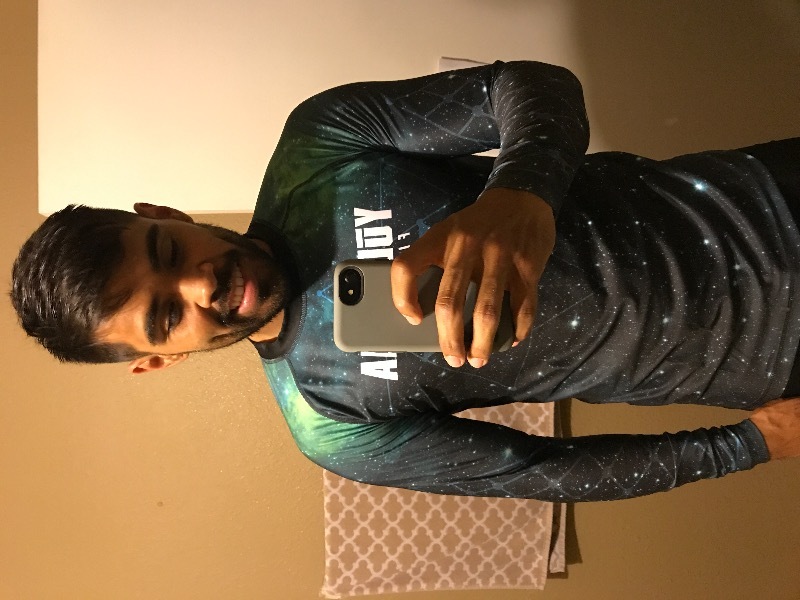 This rash guard, with its beautifully rendered galaxy, dazzling stars, and ghostly, swirling astral trails, is a nod to Da Vinci and his Vitruvian Man, which depicted the ideal proportions of man according to geometry during the renaissance era. Maybe we aren't all ideally proportionate physically, but what else is there in life, but to be mentally and spiritually ideal, which is exactly what this design represents. This representation is even more evident when we look to the Shield of David, AKA the Seal of Solomon, on the front of the rash guard, representing the spiritual ascendance of man's "inner self". Item in perfect condition. Good shipping experience. I have revecived 4 complements on it during the three times I have worn it to the gym. Bought it for my son for Christmas, he loves it. Exactly what he expected and fits great.